Blueberry is considered one of the super fruits due to its high ORAC (oxygen radical absorbance capacity) value. ORAC measures the antioxidant properties in foods and is used as an indicator of its effectiveness at fighting free radicals. Blueberry is rich in anthocyanin, an oligomeric proanthocyanidin which plays an important role in the maintenance of our collagen and elastic structure. It is also known to support healthy cholesterol, blood sugar and blood pressure levels. 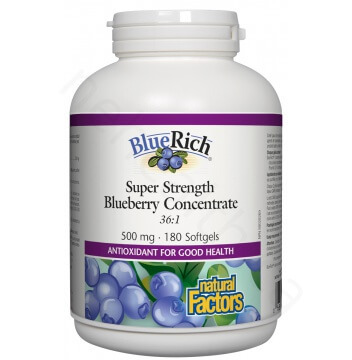 Daily intake of Natural Factors BlueRich® Super Strength Blueberry Concentrate will give you all the antioxidant protection you need to maintain a healthy cardiovascular and eye health. 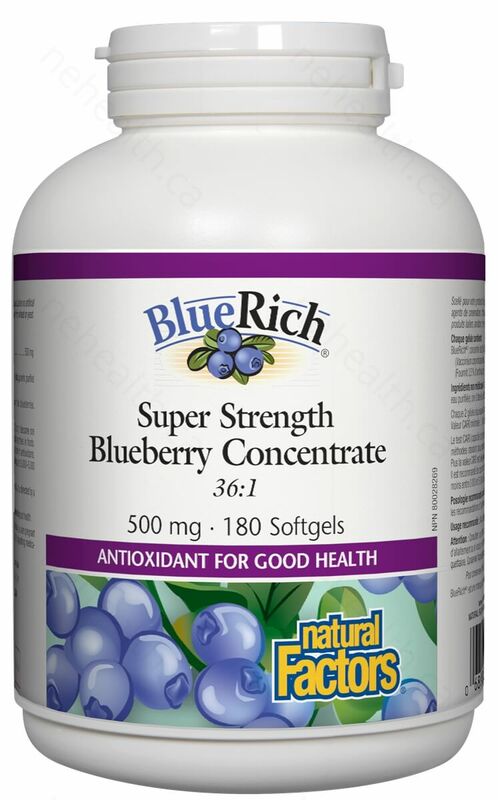 What Are the Key Health Benefits Associated with Natural Factors BlueRich® Super Strength Blueberry Concentrate? Organic flaxseed oil, softgel (gelatin, glycerin, purified water), yellow beeswax, non-GMO sunflower lecithin. 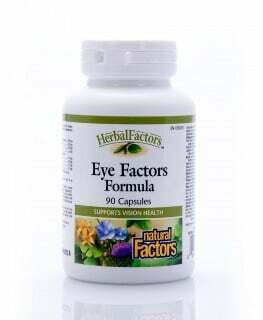 Take 3 softgels, 3 times daily or as directed by a health care practitioner. 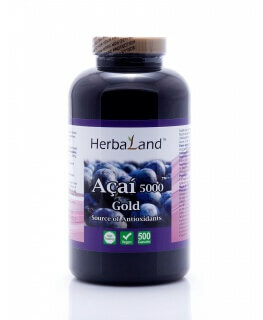 (A total of 9 softgels a day will provide between 900 to 2,250 ORAC units). Two softgels is equivalent to 1/4 cup of fresh blueberries. Sterling, Marilyn. "Got anthocyanins." Nutrition Science News (2001): 1-6. Boniface, R., and A. M. Robert. "Effect of anthocyanins on human connective tissue metabolism in the human." Klinische Monatsblätter für Augenheilkunde209.6 (1996): 368.